June 20? That's even worse! 20 days passed that I haven't read this book! Blasphemy! Not only would you get the book faster, you'd have an electronic version available instantly. I am heavily disappointed that Barnes and Nobles has yet to get it in my area. Now if I want to drive 50 miles I can get it. Stupid. Not to mention I'd rather not have to pay a heavy shipping on a book that will get read and shoved on a shelf afterwards. Did you ask if they could order it for you? The amount you'd spend on gas would far outweigh the cost of getting it shipped, but I imagine B&N (or any other bookseller) can order you anything their distributor has (and book distributors should have this book now). Apologies for the two errors noted--they'll be fixed in subsequent printings. Great to hear that she will be writing another. This girl can write. Awesome news! Can't wait to hear what it is about! Please let it be a book about either Mendev/Worldwound or Cheliax (possibly Isiem's "adventures" there?)! Alas, no. The scope's likely to be a little more claustrophobic. It is possible that someday I may try to do something set in one of those two regions, however, because I would like to bring about a convergence between certain characters from Nightglass and certain character(s) from "Certainty." And either Mendev or Cheliax would be the most logical place to do that. But that's not this story, yet. Finally finished it, I love my 4 minute bus commute, but it is really killing my bus reading. I looked over the reviews and Karameikos hit exactly what I was thinking. I loved reading about the environment. I loved the insight into Nidal, but never really cared for Isiem. Additionally, after some of the comments mentioned her online Pathfinder story, I clicked on it and was reminded of something I have wondered about. Why, after a story is finished, are the stories left in a backward chapter order? I started reading this yesterday. I had suspended my subscription due to financial concerns, and so missed three books (Song of the Serpent, City of the Fallen Sky, and Nightglass). I picked up the ePubs that I missed with the Christmas Discount. I am sad that I did not start with this book when I began reading my backlog. This book grabbed me in a way that Song of the Serpent and City of the Fallen Sky did not. I'll reserve final judgment until I am done with the book, but this is shaping up to be one of the better books in the Tales Line. I really want more Isiem now. And more of a look inside his headspace. I really liked how his rebellion was a slow burn(that "slow slip into apostasy") and that he really was part of the system, not coming out of Nidal as relatively clean and untouched as Drizzt. Even his big heroic moment in Nidal is morally compromising, though he does the best he can with what he's given. Also, I really worried Honey was going to have to be eaten before it was over. That probably would have wrecked him a bit. Really happy that this book shows the people in Nidal as victims of their own culture too. Also, all the behavioral, anatomical, and cultural details on the strix were great. I loved how they have some potentially horrifying(to us) customs that reflect some of what we see of Nidal, yet the character of what they do and why is entirely different. To anyone interested in the strix, this is a must-read. I also loved how, certain activities the protagonist is involved in "offscreen" aside, Cheliax truly comes across as far less horrifying and oppressive than Nidal. To the point that once it gets there, the reader can honestly say "Oh thank God, he's in Cheliax now". Fair warning to readers, child endangerment is certainly a thing here. Let's put it this way: If Korvosa's Acadamae is Hogwarts if Voldemort took over, then Dusk Hall is that with Pinhead in charge. 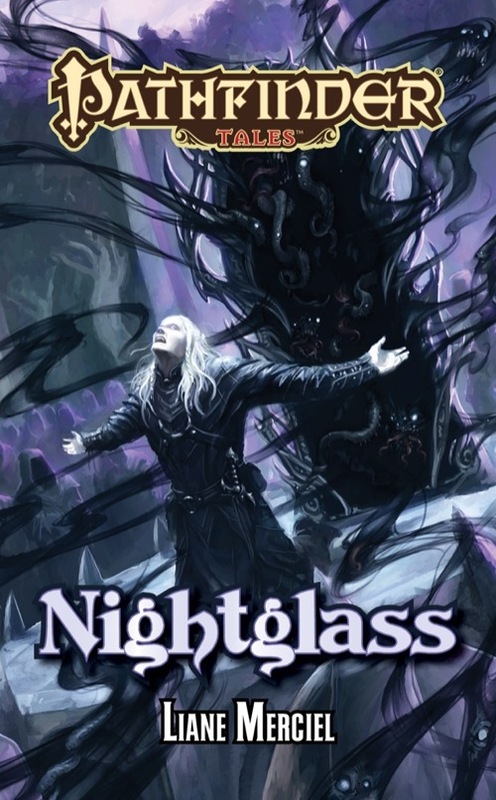 I hope you can keep the same kind of mood and atmosphere as Nightglass, though the short description of Nightblade hints at something more traditional as a fantasy novel (but I pray you'll surprise just as you did with Nightglass). I really enjoyed this book, it stands out of the crowd of usual hack and slash or adventure type stories set in fantasy settings. Here, no group of super heroes plowing through obstacles and getting rid of them usually by brawn (or magic super powers) and witty end lines. What you'll find is closer to (dark) mood and emotions, the heavy atmosphere of a nation using torture as means for its ends, and the path one of it's shadowcaller follows through his apprenticeship. I'd really like more of this kind of books, they're so rare. The first part of the book reminded me very much of the Tombs of Atuan by Ursula K Le Guin (2nd book of the Earthsea series). The second part is a bit more conventional as a plot, but using a different point of view for the main character, who comes to understand and embrace a very different culture. The novel is of a very high quality. Enjoy it ! I'm about halfway through this, and really enjoying it. I'm curious about something, though. Isiem is called "shadowcaller". I suspect that title is not related to the summoner class archetype, since he's pretty clearly not a summoner. He's a wizard, certainly, but also, I think, a cleric. His doubts have led him into apostasy, though. Perhaps he's better described as an ex-cleric. The CRB says "A cleric who grossly violates the code of conduct required by her god loses all spells and class features, except for armor and shield proficiencies and proficiency with simple weapons. She cannot thereafter gain levels as a cleric of that god until she atones for her deeds (see the atonement spell description)." Seems to me this fits Isiem, at least at this point in the story (after the destruction of Crackspire). I suppose he might be a prestige class, probably Mystic Theurge, but that seems unlikely - and the description of that class doesn't say what happens if such a character falls into apostasy. I suppose he would, like a cleric, lose all spells and divine class features, but would he also lose the ability to advance in the mystic theurge class?